If you fancy yourself a nature lover, there’s a habitat for elephant seals along the California coast that you won't want to miss. About a bit over an hour south of San Francisco near Pescadero, during the December-to-March mating season, there are docent led nature walks at Año Nuevo State Park, where you can learn all about the habits and habitats of one of nature's most enormous creatures, the elephant seal. The main attraction is always the great northern elephant seals that can weigh 2½ tons each, but other spottable species include sea lions, otters, and harbor seals. It's fun to watch the big bulls fight for dominance on the beach and strut their stuff to attract the bevy of ladies in waiting. At the end of the party, many of the females — pregnant from the year before — give birth in the sand. Then it’s off to the ocean until next year’s call to revelry. Hunted to near extinction in the nineteenth century, the elephant seal population dwindled to about 100 animals. Protected by the American and Mexican governments starting in the early 20th century, the population has rebounded to some 150,000. 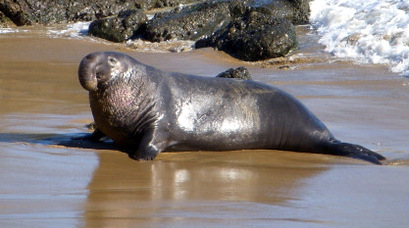 The first elephant seal sightings at Año Nuevo began in the 1950s. The first pups were born on the mainland in the 70s, and by the mid 90s, the number of local births was in the thousands. This is successful conservation in action! In March, and after the main group has departed for parts unknown, the pups and several hundred elephant seals remain to rest and recuperate along the beach and molt – not as lively as mating, but still worth seeing. Be forewarned, on warm sunny days, there is nothing quite like the aroma of a molting elephant seal. Just off the mainland sits barren, windswept Año Nuevo Island, home to the remains of a 19th-century lighthouse. The historic keeper's house shown above was constructed in 1872, and now provides shelter to an assortment of cormorants and Seaslions. You will walk approximately three miles during a tour at Año Nuevo. Wear comfortable clothes, especially shoes, because your guided walk will take you over varied terrain, including sand dunes - and you know what it’s like to trudge in sand. Also, wear appropriate headgear because the tours go, rain or shine ­­­-­­ and umbrellas are not permitted. NOTE: There is an accessible boardwalk via van for those needing mobility assistance. Ask for details when purchasing tickets for the tour. For more information about visiting with the fascinating elephant seals, check out the park’s website here. There’s also a worthwhile Marine Education Center located within the park boundaries with interesting animal, plant, and geological exhibits, along with information about the colorful history of the area. Año Nuevo State Park is on California Route 1, approximately 20 miles north of Santa Cruz, 35 miles south of Half Moon Bay, and about 60 miles south of San Francisco. Treat yourself and your family to a visit with the magnificent elephant seals. We recommend it. The scenic ride along iconic Highway 1 is icing on the cake.